Since 1972, Progressive Laboratories™ has had a very clear mission – to create science-based, targeted nutraceuticals to help patients maximize their health potential. This passionate commitment extends to product development that applies nutrition science and peer-reviewed scientific literature to produce high quality, synergistic nutrient and botanical formulations. 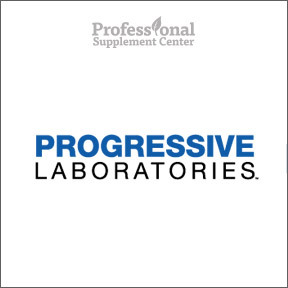 In their creation of top-of-the-line products, Progressive Laboratories™ utilizes quality-verified raw materials sourced from American and European suppliers. These carefully sourced raw materials undergo detailed analysis to identify and verify their proper potency and purity. Progressive Laboratories™ requires all manufacturing processes to strictly follow the highest standards and quality control procedures of all current Good Manufacturing Practices (cGMPs), including 3rd party NSF certification. All products are manufactured in the U.S.A in their FDA registered manufacturing facility. Along with these high standards, their quality assurance and control procedures ensure purity, potency, efficacy and clinically measurable improved health outcomes. To maximize the health promoting potential of all their products and to exceed the high expectations of nutritionally oriented physicians and their patients, Progressive Laboratories™ works with board certified physicians, scientists and nutritionists. Progressive Laboratories’™ unique, effective, innovative nutraceutical solutions are available solely through licensed healthcare providers. U-Tract® – This popular product contains D-mannose, a simple sugar that supports digestive tract health and aids the urinary tract by helping to wash away harmful bacteria normally present in the digestive tract. As very little D-mannose is metabolized, it does not interfere with blood sugar regulation. No additional ingredients. Amino Blend® – This highly rated product provides a blend of 21 free form amino acids in the naturally occurring proportions of glandular tissue. Amino acids are necessary for the growth and maintenance of all intra- and extra-cellular tissue. This product supports the need for additional protein, especially when under stress. Probiotic Broad Spectrum – This specially developed probiotic formula provides a blend of 10 high quality probiotic species. The patented Bio-tract® delivery system ensures live organisms are delivered to the intestines. One capsule provides 10 billion CFU plus prebiotic support. No refrigeration required. This entry was posted in Home and tagged Amino Blend, Probiotic Broad Spectrum, Professional Supplement Center, Progressive Laboratories, U-Tract, Vitamins and supplements, www.professionalsupplementcenter.com. Bookmark the permalink.